Ownership of a Virginia riverfront property is a lifelong dream for some. Most potential owners that dream this dream, are aware of the challenges, and have sought to manage the inherent risks by facing them head on and making their decisions accordingly. Flooding. Whether caused by Global Climate Change or naturally occurring climatic cycles, there can be no denying the higher quantity of atmospheric extremes. EPA Intrusion. An increased awareness of issues and a larger bureaucratic presence have resulted in an enhanced profile of the EPA, especially around natural water formations. Zoning Regulations. As governments have expanded, the desire to control land use has become more invasive with every levy and tax. Flooding is a natural end result of water coming into an area faster than it leaves. The melting ice sheets have added significant amounts of water to the fresh water environment. The movement through the solar cycles from maximum to minimum has recently kept more energy at the surface of the Earth, resulting in more volatile weather extremes. Quite simply, the possibility of intermittent flooding and high rain soaked winds cannot be ignored. However, once identified, the challenge can be addressed. Start with the Corp of Engineers to identify historical patterns of flooding in any target area of Virginia’s River Basins. If building a new structure, be certain to take advantage of a higher elevation for your home. Use waterproof materials on the lower levels (think concrete) as well as a good sump system to remove water from the basement should the home experience flooding. Also, keep emergency generators as high as is reasonable to prevent a lower level flood from knocking out your emergency energy supply. The EPA can be your best friend, especially as it applies to protecting your Virginia Riverfront Estate from toxic runoff. Any factory or commercial facility upstream from your dream property should be scrutinized for heavy metals, and any other residual pollutants that may affect the quality of life on “your” riverfront. Large farm runoff can add significant levels of nitrogen (from fertilizers)which result in the bloom of alga in river pools, killing the fish and the usual bottom dwelling organisms essential to healthy water stock. But of most concern should be issues of your target property’s toxic liabilities. If your dream property is of any size at all, prior to purchase, due diligence may require an environmental assay of the property. One 55 gal drum of a toxic chemical can be grounds for a daunting clean up. Additionally, if there is an existing structure with a septic system, (as is often the case in remote riverfront properties), total compliance with EPA system requirements must be adhered to. Recent enhancements in most state EPA compliance codes allow functioning systems to remain. However, in the desire to become more sanitary, especially as it pertains to water ways, the EPA requires that repairs result in total replacement, as opposed to retrofit. Think lots of money. The Army Corp of Engineers has the final say on the issue of Wetlands. Wetland development can be difficult if not downright impossible. Check with the Corp to determine the wetland status of your prospective Virginia Riverfront. Finally, be aware of designated wetlands. A wetland designation has befouled many dreams. Don’t let it happen to you. As if that were not enough, there is the ever present eye of the public. If you see a gem of a site, odds are someone else is looking at it too. The assault can come from any of the three levels of government. How many times have you heard the expression “eminent domain”? Used by governments at all levels to clear the way for highways and schools, eminent domain has become a tool for the more local arms of government. 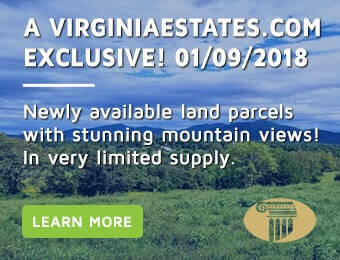 Who doesn’t think that a lovely little piece of property with a great view of the mountains on a green river bottom with little development wouldn’t make a great park? It can happen to you. Manage your risks. Realize your dreams. It does seem like a mountain to ascend to comfortably abide down by the river. Look at your potential dream site with a careful eye. Perform the due diligence. The risks are there, but manageable. Make certain you understand the issues involved with any property you seek to own.